It's here! 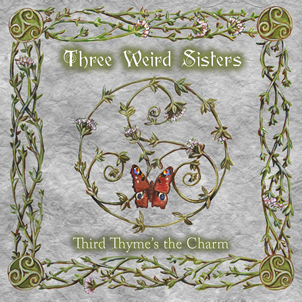 Three Weird Sisters, along with Bedlam House Records, are pleased to announce the release of our new album, Third Thyme's the Charm! It is produced by Greg Robert and released on the Bedlam House label. It is available at CDBaby, iTunes, and Amazon. This album has been a long time coming with many changes over the years, what with Gwen moving away to England, Brenda to Indiana, and Mary hailing from Alabama (Teresa still resides in Georgia). This has placed all four of the Three Weird Sisters in different states (and in Gwen's case, on separate continents)! We appreciate everyone who made this project possible, with an extra special "thank you" reserved for YOU, our fans; without you, none of this would have mattered nearly as much. We so appreciate your patience and sincerely hope you love the results as much as we do. In honor of our newest project, we've updated and remodeled our website. In addition, we've become much more active with social networking. Come find and friend us on Facebook and Myspace, and don't forget to follow us on Twitter. While you're at it, join our new mailing list (right side panel) to be kept up to date on the latest happenings...you, too can be a "Weirdo" for Three Weird Sisters! 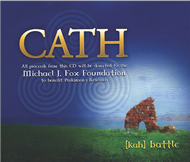 Cath Benefit CD Available September 21, 2012! Recently, our friend Melissa Tatum asked us to participate in a project to benefit the Michael J. Fox Foundation for Parkinson's Research. Cath (pronounced "Kah") is a collection of songs written by Melissa (an amazing lady who is personally afflicted with Parkinson's Disease) and performed by various participating artists. We are truly honored to be a part of it...please find out more about Melissa's project HERE; while you're at it, please "like" her Facebook Page and help us help her spread the word! ©2012 Three Weird Sisters. All Rights Reserved.